Hello lonely blog - I spend a wonderful week with my sister. The last couple of blog posts I had set up delayed posted before I left. I will post a couple of pictures and some cards I made when I was on my second half of my vacation a little later this week. Until then I still have some pictures from cards I made before I left. 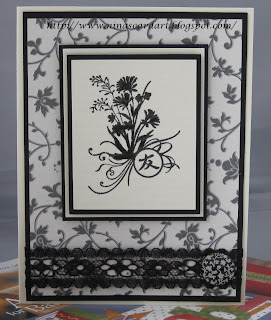 When I was planning to make a wedding card I picked up way to many supplies by Making Memories – Black Tie. I could not just them sit now could I? Supplies: Cream and black cardstock, Designer paper – Making Memories Black Tie, Inkadinkado – Flower (Friend),Making Memories – Black tie trim ribbon, Making Memories – Black Tie designer buttons. Hello Monday :). A little masculine card today. 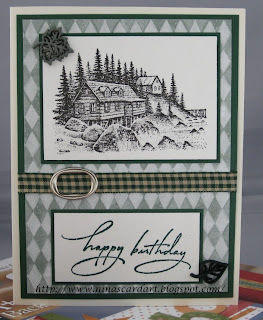 Supplies: Cream and green cardstock, Designer paper – DCWV Mat Stack, Stampscapes – Seaside dwelling, Stampabilites – Happy Birthday, Paperwishes - Silver Buckle Slides, Dress it Up – Raking Leaves button, green gingham ribbon. Vegas Baby, yup I have been MIA because the hubby and I took a little vacation. Sorry no pictures to follow, if you can believe it we took NONE.... not a one. The heat, way above Victoria heat, the walking, tons. I will blog about stamp store in another post. Here is a cute little owl card to tide you over. 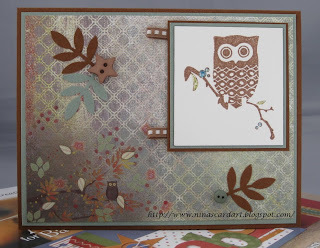 Supplies: Brown and Green cardstock, Designer Paper – Memory Box Twiggy, Inkadinkado – Birds Galore, Close to my Heart – Chocolate Collection ribbon, Dress it up – Buttons, Martha Steward – Frond Branch punch. 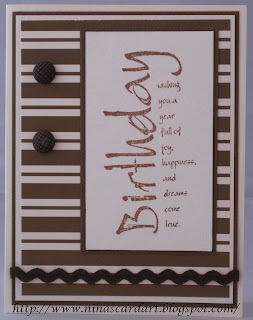 I really enjoyed making this card, I really do love this Stamp set from Stampin' Up!. I colored the stamp with my Tombo markers then stamped, I like the watercolor effect. 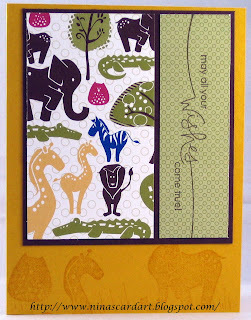 Supplies: Cream and green cardstock, Designer paper – DCWV The Far East Stack, Stampin’ Up! – Asian Artistry, Prima Nursery Tales flowers, Kaiser Scrapbook Pearls. 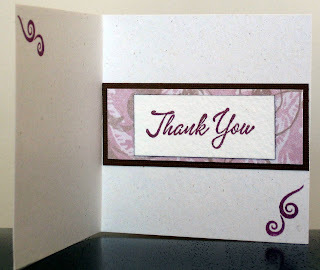 With this note card, I stamped the image with Versamark and then colored it with PearlEx. It turned out wonderful but I need to find something to spray over it to seal it and that will not warp the paper. As I was putting this in its envelope I stuck my thumb right in the middle of the butterfly. It did not do much damage but over time it would. A new week :), I made a couple of little note cards that were approximately 3in square. This first one was unfortunately a sympathy card for a friend who lost her cat Ceasar around the same time that we lost Vogue. I naturally forgot to take a picture so I had her snap off something quick for me. I was unable to brighten the image though. The little paw print is quite small, about the size of a dime the stamp is from a Inkadinkado clear stamp collection that I got a Costco forever in a scrapbook kit ago but fit this little card perfectly. 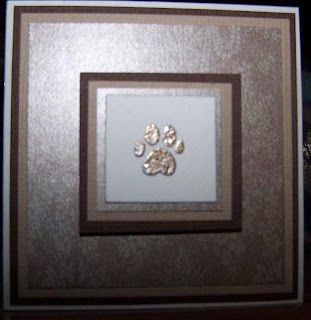 Supplies: Cream and brown cardstock, Designer Paper-DCWV-Luxury Stack, Inkadinkado-paw print, Metallic Medley embossing powder. Welcome Saturday.. No sun, just a little gloom maybe a little rain. Bring it on, the forests could use a drink. I don't think I have posted this card yet. I sat down last night thinking I would just put the finishing touchs on a card I had started two days ago.... ipod with audio book on, 5 cards later. I will post those next week. I also have a couple of cute notecards to post.. boy I am not doing very well am I.
August was my month to spend for my workshops.. groan. I know I will be paying for another few months, was it worth it? You betcha. 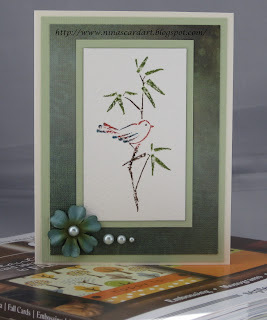 I could not wait to play with my new stuff so I tried my tombo markers on this stamp. I felt the need to fill in space with these little dragonflies, I am still contemplating that choice. 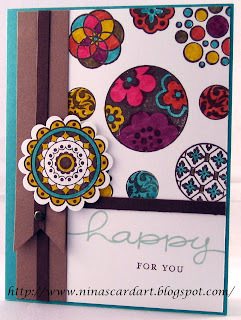 Supplies: Cream and burgundy cardstock, Designer paper – DCWV The Far East Stack, Stampin’ Up! 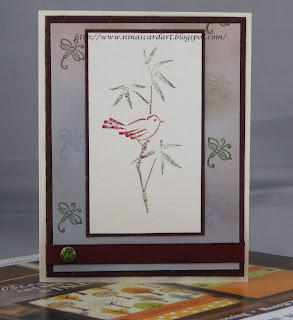 – Asian Artistry, Stampendous – Dragon Fly, Recollections Gemstone Brads, misc burgundy ribbon. I hate that when I get up in the morning now it is getting darker, the sun is still shining during the day but I am already starting to morn the loss of summers long days. So I am taking a break from workshops this month, so I will have to get creative on my own so I have something to post. I have be really drawn (well when am I not) to natural colors, this time though it is browns and tans I guess they seem to inspire me the most. 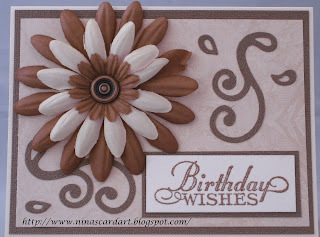 Supplies: Cream and brown cardstock, Designer paper –Hot of the Press Wedding and Romance, Inkadinkado – Birthday wishes, Making memories - Antique Copper Brad, Hot off the Press – Chocolate flowers, Sizzix - Scribbles Swirls. 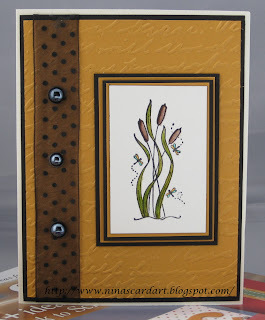 Last one from the Stampin" Up! workshop. Supplies: All supplies Stampin' Up! 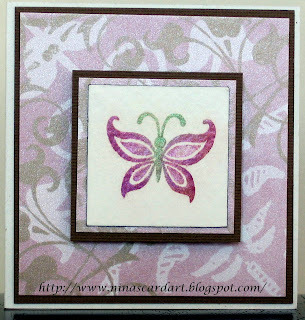 I am going to post the third card from the Stampin' Up! workstop a couple of weeks ago. Babies babies every where, I don't think I have ever purchased so many Baby cards never mind having made them. It seems every time I turn around a friend is having a baby, welcome little Amelia. I cheated a little with this one, I used Jolee's Boutique Baby girl outfit. 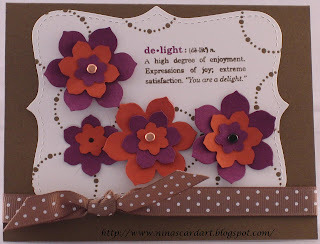 I had a onesie in my head for this card and this embellishment set was perfect. I stamps Congratulations in the inside. Good morning - I am so glad it is the weekend. I am going to enjoy these next few days, I don't really have plans but I hope to sit down with my stamps to make a few cards... I need to make a few cards. This is number two from the Stampin' Up! get together. The techniqie, making our own patterned paper.